Text on screen: What is radiation? What do smoke detectors, emergency lights and nuclear power all have in common? Radiation! But what exactly is radiation? Thanks to high-school science class, most of us have heard about radiation. But many of us may not know exactly what it is. I'm Julie, and I work for the Canadian Nuclear Safety Commission. Simply put, radiation is the release of energy in the form of moving waves or streams of particles. This energy can be low-level, like microwaves and cell phones; or high-level, like X-rays or cosmic rays from outer space. These are known as non-ionizing and ionizing radiation. (Julie's name/title super disappears. Cut to a medium long shot as Julie gives examples of non-ionizing and ionizing radiation applications, visuals illustrating each of the examples she gives "appear" on the screen above her: a microwave, cell phone, x-rays, and cosmic rays. As well, the words "non-ionizing" and "ionizing" appear to the left and right of her as text-on-screen). But if we really want to understand radiation, we need to go inside the tiny world of the atom. Remember that high-school science class? Atoms are the microscopic building blocks of all matter in the universe. Everything around us is made up of atoms, from the largest galaxies to our own bodies. The centre of the atom is called the "nucleus." That's where the word "nuclear" comes from – there is a tremendous amount of energy inside! The nucleus of an atom is made up of two particles: protons, which carry a positive charge, and neutrons, which have no charge. Outside the nucleus are electrons, which carry a negative charge. The attraction of these negative electrons to the positive nucleus is what keeps the atom together. Now, every element in the periodic table has a specific number of protons and neutrons. But sometimes an atom will have too many or too few neutrons. When this happens, it becomes unstable, or "radioactive." An unstable atom is called a radioisotope. For example, two extra neutrons in a hydrogen atom creates the radioisotope tritium. That's the stuff that helps make exit lights glow in the dark! Alpha, beta and gamma. Alpha particles are heavy and travel small distances; beta particles are lighter and travel further, and gamma radiation is actually a wave and it travels the farthest of all. The time it takes for half of the radioactive atoms of a radioisotope to decay is called a "half-life". Half-lives can range from a fraction of a second, to billions of years. Let me give you an example of how half-lives come into play in nuclear medicine. Doctors inject patients with the radioisotope Technetium-99m which emits gamma radiation. A gamma camera can then take pictures of the patient's insides to help with the diagnosis. The relatively short half-life of 6 hours for this radioisotope makes it ideal for these types of tests. Let's pretend these jellybeans are the nuclei of Tc-99m. After one half-life, half the atoms still in the body remain unstable, or "radioactive". After two half-lives, one quarter of the atoms remain radioactive. After three half-lives… well, you get the idea. After 24 hours, almost all the radioactivity is gone, thanks to radioactive decay and the body's natural… shall we say…"processing." And that ends our science class on radiation. Congratulations – you passed! Now for the bonus question: can you tell me who keeps an eye on the nuclear sector in Canada? That would be us, the Canadian Nuclear Safety Commission! We regulate the use of nuclear substances and materials, and ensure that all nuclear materials are used for peaceful purposes. We also work to protect your health and safety, as well as that of the environment. The Canadian Nuclear Safety Commission: the answers you need, from a source you can trust! Visit us at nuclearsafety.gc.ca, on Youtube or Facebook. Text on screen: We will never compromise safety. Ask an Expert: How are children protected after a nuclear accident? Ask an Expert: After a nuclear accident like Fukushima, why aren't all members of the public monitored continuously? Ask an Expert: Why do guidelines allow orange juice to contain more cesium-137 than bottled water? Ask an Expert: Do dried fruit contain more radioactivity than fresh fruit? Ask an Expert: Is it safe to eat rice, produce and fish imported from Japan? Visit the CNSC's YouTube Channel. 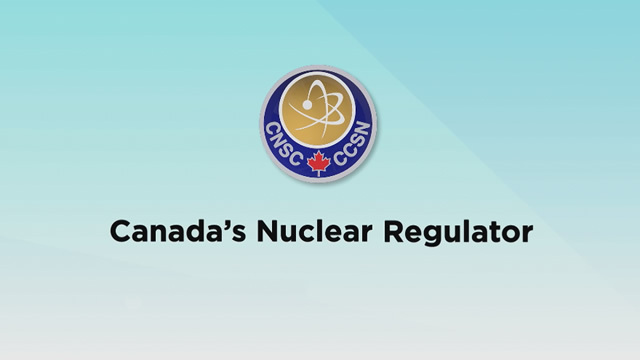 Check out the CNSC videos explaining the nuclear sector in Canada, and how it remains safe through our regulations. You can explore our "Ask an Expert" video playlists, or catch up on past Commission hearings and meeting presentations.